My son loves dinosaurs! For his birthday last year, I baked his Volcano Birthday Cake in my Pampered Chef batter bowl. Once a toothpick came out clean when inserted, I cooled the cake and flipped in over onto another cake in a 13×9. For the landscape, I used green buttercream icing. 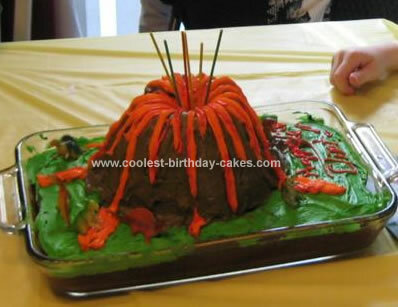 On the volcano itself, I used brown icing. Then with a star tip on in my pastry bag, I made lava streams down the side of the volcano. Plastic dinosaurs all around completed the dino landscape. To make the eruption extra “real” the candles I found actually had sparks flying from them! This year I’m doing the same idea but he wants an ice cream cake. Instead of cake, mint ice cream will go in the batter bowl, and lots of oreo cookie crumbs for dirt. Also, I will use chocolate and caramel topping. The orange icing will still be the lava. For the base of the volcano, I’ll use chocolate ice cream and green tinted cool whip. Of course, the sparkling candles will make a comeback too! Birthday cake idea posted by Noel K.